Self-monitoring your blood sugar provides you with immediate feedback! These readings can help you make decisions about food choices and physical activity. 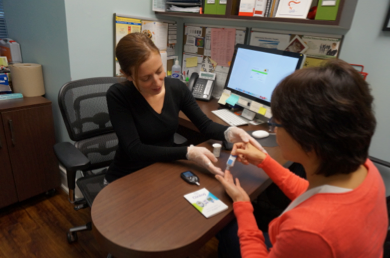 You can learn how to monitor your blood sugar during a one-on-one appointment. A glucose meter that best suits your needs is provided, along with a step-by- step tutorial on how to operate your new device. Please note that self monitoring of blood sugars may not be necessary for you, we can help you decide if it is a worthwhile tool.